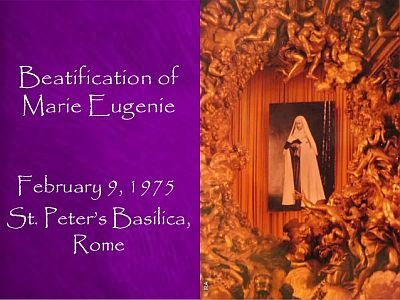 Forty-three years ago today, Mother Marie Eugenie was beatified by Pope Paul VI. The following excerpt from the book written by our former Superior General, Sr. Helene - Marie Bories, RA -- "Marie Eugenie Milleret: A woman's spiritual search in 19th century France" -- speaks eloquently of that moment. "On Sunday, February 9, 1975, pilgrims coming from all over the world converged on Rome. Thanks to post-conciliar openness to change and the internationality of the congregation, they were going to witness a beatification ceremony different from any other before it. For the first time, the old basilica of Saint Peter resounded with hymns in the principal languages of the crowd as well as the traditional Latin of the Sistine choirs; for the first time, the drums of Africa were allowed to find their place in the liturgy. And on the Altar of Confession, right above the tomb of Saint Peter, Pope Paul VI proclaimed Mother Marie Eugenie Milleret to be Blessed Marie Eugenie. At that moment a huge photo of her (the first ever photograph used at such a ceremony) was unveiled in the Gloria of Bernini to the lengthy applause of the young and cosmopolitan crowd. From that moment on the entire Church, and particular that of Paris, could celebrate the feast of Blessed Marie Eugenie each March 10. "She is our contemporary in the problems that she lived with and the solutions that she attempted to bring to them. The saints, because they are the intimates of God, do not become outdated! The holiness sought after in every state of life is the most fundamental promotion that women can attain. Will this ceremony be without a tomorrow? No! We shall return to our tasks, carrying away with us the humble and ardent longing for holiness. We must dare to be holy! Marie Eugenie has accomplished miracles since her death, but the greatest miracle is the very existence of the congregation she founded in 1839. What is not possible to express concerning the foundress can be expressed, shown, and revealed by the Assumption's living its mystery in spite of its weaknesses, shortcomings, and failings."